The Victorian-style Hotel Limpia, built in 1912 by the Union Trading Company (owned by local stockholders J.W. Espy, J.P. Weatherby, and Nick Mersfelder) may have been promoted as a summer retreat for wealthy cattlemen but, in reality, it served as retreat for ranchers, travelers, and locals regardless of the number of cattle they commandeered. 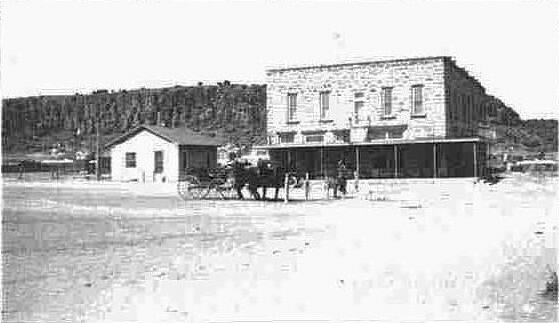 Shortly after its completion, built on land originally deeded to Pedro Guano for his service in the Army of the Republic of Texas, the two-story pink stone hotel became the community’s social center and featured a doctor’s office and drugstore alongside its guest rooms and generous porches. Out-of-town guests were known as “Summer Swallows”, arriving in time for the cool summer climate that Fort Davis and the surrounding Davis Mountains offered. 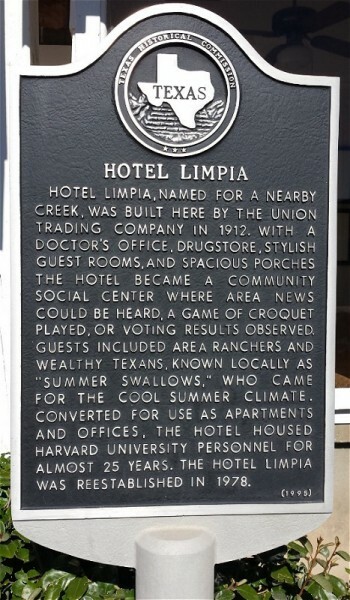 The current structure was not the first Hotel Limpia in Fort Davis. An earlier permutation, constructed of adobe by local James Kebbee in 1884, was located just outside the local military garrison, now Fort Davis National Historic Site. Today, Hotel Limpia offers most all of the modern conveniences in its twenty-one rooms and ten suites as well as a favorite from its early days – the cool summer climate.